Yesterday, a fantastic story emerged tied to the NFL’s greatest coach and him heeding the suggestion of a sports writer. When talking about 2019 Super Bowl MVP Julian Edelmen, a 2009 seventh-round pick taken 15 spots after the Bucs drafted cornerback E.J. Biggers, Bill Belicheat credited retired Dallas sportswriter Rick Gosselin for referring Edelman to him prior to the ’09 draft. As the story goes, Edelman was a quarterback at Kent State and Gosselin told Belicheat he thought the young man could play in the NFL but just not at QB. That specific discussion prompted Belicheat to dive in to deep study on Edelman. Gosseling was known for his annual special teams grades in the Dallas Morning News, but per JoeBucsFan.com columnist Ira Kaufman, Gosselin also was known for bringing big notebooks to the NFL Scouting Combine and for putting in a ton of work on the draft on all fronts. Belicheat praising Gosselin publicly for the tip is very high praise and very rare. And guess who was the Patriots’ director of player personnel back in 2009? That’s right. Bucs GM Jason Licht. Joe wonders if Licht would ever take a sportswriter’s lead or tip seriously when it came to a football player. One guy who would was former Bucs commander Greg Schiano, who openly told Tampa Bay media that he wanted to hear from them if they had a legitimate football suggestion of any kind. When Schiano coached Rutgers, apparently he had got a valuable assist from a local scribe once. As much as Schiano and one of his family members, personally read this website, Joe never felt the urge to make a private suggestion to Schiano. As for Mr. Licht, keep your ears, eyes and mind open. 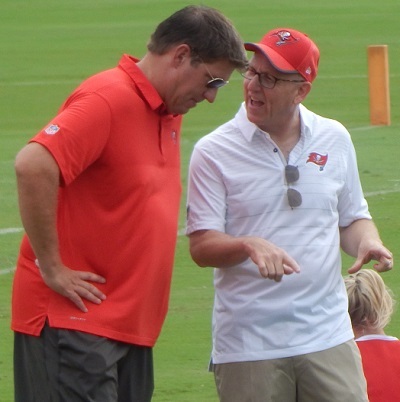 The best advice I can give Jason Licht is to quit trying gambling on picks……For example, there were running backs rated higher than Rojo….& why bring in a west coast guy when there are good east coast & southern backs….also….there we several higher rated CBs available when he chose MJ Stewart…….and he actually chose Stewart before Davis. Go with the consensus picks…..the ones that most everyone has ranked….play it safe, Jason….you’ve made enough mistakes. I think Licht should hire a few scouts from the Tampa Bay Lightning. They have a load of talent, many they drafted in the late rounds. thought he played for kansas state under bill syder?…..
anyway, licht should check out tytus howard and chuma edoga…..those are legit suggestions…. i agree….licht seems to always out smart himself instead of the rest of the NFL…..
Licht has made some good picks, along with bad. I can live with him as our GM. The thing I noticed, though, is after we took MJ Stewart in the 2nd Round last year and the media asked him about the selection, the first thing he said is that Stewart is “versatile”. That should never be the best trait about a second round cornerback. I hope we can salvage the pick by moving Stewart to safety, or maybe he can be the slot corner. No all that excited about some of the picks Licht has made. Its terrible how many R2 and even R1 picks have not been good at all. Too bad Jason pride got in the way of trading DJax…. compared to what he said about c.davis, he talked about his length, speed his aggressive playing style, sure tackler…..lol…. maybe MJ was thinking too much instead of just playing….im not gong to hold his 1st year against him because so many players were looking clueless in smittys system but i agree with your statement….hopefully, at the worst he can be a back up safety ST ace and provide great depth in the secondary….you can never have too many good players on a team….hopefully he’s one of them…..
No offense Joe, but here’s to hoping that Jason doesn’t listen to you guys regarding college prospects. With Barber beingngood, and Jones being unknown I would not draft a running back innthe first round….but I woukd like a bigger back who can move , who can catch and block big line backers. LJ scott stole my heart when watching his highlights. Is it ok to share this on here? Don’t get any ideas Joe. You’re in the entertainment biz. For the love of all that is holy, take Joe’s suggestions and flush them directly down the toilet. nice draft but im not sure benny will last that long….imo, he’s a 2nd rounder….hope im wrong tho…. Unforunately, Jason listened to all the folks that couldn’t believe how great a college kicker was that never missed an extra point and drafted him 5 rounds too early. Some of Jasons moves have been dumb. Backstabbin’ Jason Licht should not listen to Joe. We haven’t forgotten that you wanted the Bucs to draft Johnny Manziel over Mike Evans. Lord C … I saw that same 4-round mock draft earlier today and immediately though “Rats, they’ve got the priorities backwards again”. I like the Oliver pick at DT (Rnd 1), but would still rather have an OLineman (preferably a stud LT). Also see Oliver more as a 3-4 DLineman (only weighs 275 lbs & heaviest he played at was 282 supposedly … that’s not GMC’s replacement & the only way we should go DT in 1st Rnd IMO is if that player will be replacing GMC). Also don’t get why we’re drafting yet another CB instead of a MLB or RB or OLineman in that 2nd Rnd spot (after trading down). It’s a safe bet that if anyone in a NFL front office reads Joe’s post they know not to listen to any personnel advice he has. 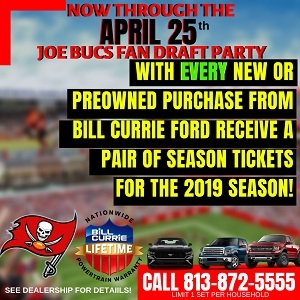 813bucboi: Yes, we will see the true value (or lack thereof) of our draft picks from 2018 this year. You all are being pretty harsh on the Joe’s of Joe Bucs Fan, they’re mainly throwing ideas out there that pop in their heads…You know, like we all do on here. Once you get a job in an NFL front office is when you’ll be able to talk all the junk you want. Like I’m saying…..when Licht chose MJ Stewart, he was ranked #11 CB to go in the 3rd or 4th round…….Carlton Davis was ranked #7 tp go in round 1 or 2……now, if Licht wanted Davis & he obviously did…..why pick him after Stewart? I was puzzled then and I still remain puzzled. I think we were lucky to get Davis because there were 2 or 3 CBs picked between Stewart & Davis…..but how would Licht know those teams wouldn’t choose Davis? Walter Football Rankings…….& I realize there are other rankings out there but the consensus was certainly that Davis was the better option. We already had nickel covered & MJ Stewart can’t play outside……at least not yet. Given that the local media slobbers over decisions when they’re made (ie retaining Mike Smith, promoting Dirk Koetter, drafting Jameis, hiring Lovie) only to put on 20/20 hindsight after the fact, I don’t know why any coach would take the local media’s advice. @joe if they listened to u , we would have drafted Manizel and still have rockstar here. PFF had ROJO as their highest ranked Rb in 2017. He is also not a west coast guy. He’s from Texas and played a few years at USC. I remember reading or hearing something about Jason had intel that a team between the two 2nd round picks wanted Stewart so they choose him 1st. It makes sense but I can’t remember the source so it could be BS. Ronald Jones, our highest-graded RB, was clear and above the rest of the nation’s running backs with his 93.1 rushing grade this season. The Bucs clearly had both Davis and Stewart closely ranked on their draft board. They thought VHIII (at the time) could play outside with Davis opposition with Stewart nickel? Now I was really disappointed when Chubb got picked a few spots instead of Rojo and I would’ve taken him if he was available but I though for sure we were going Josh Jackson there who was touted as a potential first round CB. I remember reading somewhere that Mike Smith didn’t like or didn’t want us to draft taller corners. Why, I have no idea. Just glad that nightmare is over! I’d rather go with OL top of R2 as well vs CB. Lindstrom for example to plug in at RG immediately. But I don’t really care about replacing McCoy with an exact mold of him physically. THey would serve the same role and have the same strengths – getting to the QB with athleticism/quickness/explosion and Oliver can line up wherever on the line. McCoy has never been a beast against the run IMO regardless of him being heavier than a guy like Oliver. The best pick Licht can make is to resign. Licht set this team back years with his wasted picks. 3 years later and still looking for a running back or guard. I agree. I think jason has done a fantastic job. Many on here trash Jason for some bad moves but show me a general manager who has not made bad moves. It’s all a crapshoot, so whatever. He’s done fantastic. What I agree with is he needs to stop gambling. Every draft he takes a gamble somewhere. The kicker comes to mind. Horrible. Noah Spence comes to mind, that was a good gamble to me even if it has not paid off. Just get the best players in positions of need. For all you Licht haters, you’re idiots. On average, over a 20 yr span, 68% of all draft picks are considered busts. Thats a 32% success rate. Licht has drafted 34 players in his 5 drafts. Imo, 17 are considered successes or the book is still out due to limited playing time(mostly the players drafted the last 2 years). My list is 2014 Mike Evans, Charles Sims, Kevin Pamphile, 2015 Jameis Winston, Donovan Smith, Ali Marpet, Kwon Alexander, 2016 Vernon Hargreaves, Ryan Smith, Devonte Bonds, OJ Howard, Justin Evans, Chris Godwin, Kendell Beckwith, Vita Vea, Carlton Davis, Jordan Whitehead. For those of you who are math challenged, that’s a 50% success rate. Well above league average. For all you Licht haters, you’re idiots. On average, over a 20 yr span, 68% of all draft picks are considered busts. Thats a 32% success rate. Licht has drafted 34 players in his 5 drafts. Imo, 17 are considered successes or the book is still out due to limited playing time(mostly the players drafted the last 2 years). My list is 2014 Mike Evans, Charles Sims, Kevin Pamphile, 2015 Jameis Winston, Donovan Smith, Ali Marpet, Kwon Alexander, 2016 Vernon Hargreaves, Ryan Smith, Devonte Bonds, 2017 OJ Howard, Justin Evans, Chris Godwin, Kendell Beckwith, 2018 Vita Vea, Carlton Davis, Jordan Whitehead. For those of you who are math challenged, that’s a 50% success rate. Well above league average. Why even mention Licht at this point? It is clear that he;s been made a yes man to Bruce Arians. If the next draft/free agency period is messed up, it;s all on Arians, who now has total control. I suspect MJ Stewart is going to surprise a lot of fans this year. Stan are you saying that PFF stated that Rojo was better than Barkley? Even though I don’t believe in fake news unless it is in regards to Fox News, I believe you may be spewing fake news with that story. TDTB-I cut and pasted PFF twitter at the bottom of my post. I agree with you seems crazy but it Could be that Barkley was in a different draft class. I’m not sure what year both players were coming out. Look it up it’s PFF 2017 RB college projections. The only thing I can say is keep Licht out of the draft room.